Just as most twin pregnancies can be complicated, I am having mono/di twins which comes with its own set of concerns. I chose a theme in the nursery of dragonflys. The main symolism of the dragonfly according to Wikipedia is renewal, positive force and the power of life in general. Dragonflies can also be a symbol of the sense of self that comes with maturity. Also, as a creature of the wind, the dragonfly frequently represents change. The dragonfly knows it must live its life to the fullest with the short time it has - which is a lesson for all of us. 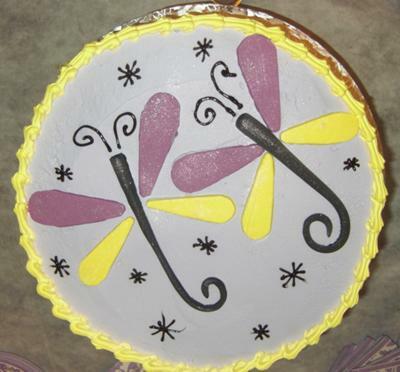 When planning my twin baby shower, my sister and sister-in-laws incorporated the dragonfly theme. Here is a picture of my cake. I love the meaning behind everything...that is beautiful.